Fountain pens, classic and contemporary, are making their mark on the market. 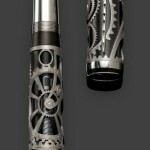 Montblanc Imperial Dragon Limited Edition fountain pen, ballpoint and mechanical pencil set, sold at Swann, March 12, 2013, for $5,760. 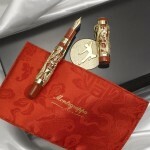 Montblanc Qing Dynasty Precious Fountain Pen, Edition 8, sold at Heritage Auctions, February 23–24, 2013, for $22,500. 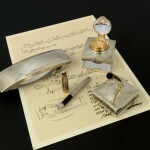 Montblanc Meisterstück Solitaire Sterling Silver four-piece desk set. Sold at Swann, March 12, 2013, for $2,640. Even—and maybe especially—in the present era of keyboards and virtual keyboards, writing with a fountain pen still has its appeal. There’s nothing quite like the feeling of a supple nib depositing a glistening streak of ink onto a creamy-smooth piece of paper, the supple lines indelibly marked, there to remain no matter what electronic catastrophes beset the world. The real aficionados prize a pen for its writing ability, but also for its aesthetic properties as an object, and in many cases for its historical value. Whether of mottled resin or precious metals inlaid with gems, fine fountain pens are keenly sought by collectors, on the auction block or in specialty shops. The generally accepted date for the invention of this wonderful device is 1884, when Lewis Edson Waterman manufactured what dealer Ed Fingerman of the Fountain Pen Hospital in New York calls “the first successfully marketed fountain pen.” Fingerman, whose shop sells and repairs vintage and contemporary pens, explains that while there were fountain pens as early as the 1850s, there was trouble with the ink and they did not catch on with the public. The golden age of fountain pens went from around 1900 through the beginning of World War II, and it was during this time that the best nibs—with the greatest variety—were made. Collectors who are mainly interested in using their pens usually focus on the golden age. With the advent of the ball point in the 1940s, fountain pen use dwindled and the variety and quantity of pens being made fell off, although the major manufacturers like Waterman and Montblanc continued to make excellent products. The “serious advent” of vintage-pen collecting, says Fingerman, began in the 1970s, and grew during the ’80s, which saw the rise of pen shows where collectors could be meet, buy and trade. Montblanc limited editions feature elaborate designs, often pictorial, that symbolize the life or works of the subject, as well as super-deluxe materials like gold, platinum, lacquer, and precious stones. Some are so-called skeleton pens, which have open filigree work over a transparent barrel so you can see the inner workings. In the Fine and Vintage Writing Instruments sale at Swann Galleries in New York on March 12, Montblanc accounted for 19 out of the 20 top lots, and most of those were of recent make. A Lorenzo de’ Medici went for $3,600, and a Marcel Proust sold for $1,800. 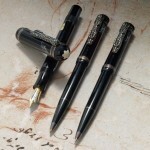 On the other hand, a non-commemorative Montblanc, the L139G model in plain black celluloid, from 1938, commanded $2,280. 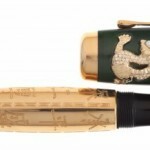 On February 23–24, Dallas–based Heritage Auctions sold a Montblanc Qing Dynasty Precious fountain pen, one of an edition of eight with black lacquer, diamonds and jade, for $22,500. The new wave of collectors is definitely more concerned with the materials a pen is made of than with its writing abilities; in fact, Fingerman estimates, almost half never use them. Ivan Briggs, head of the pen department at Bonhams, says, “There’s a great gulf between collectors of limited editions and vintage. There’s very little overlap. Limited editions are largely a pastime of the very well-to-do, some of whom collect at least partly for the intrinsic value of the materials. These pens are intended to be admired and kept in new condition.” He notes that with the rise in the gold market, gold Montblancs have gone up and are currently selling for around $10,000–20,000. Old pens tend to be much less flashy in appearance, and for the most part, the barrels and caps were made of ordinary, non-precious materials such as hard rubber or metal overlay. The hard rubber exteriors came in very few colors, sort of like a Model T Ford. Back in the early 20th century, you could have your pen in black, red, or black-and-red mottled. Black-and-green mottled exists but is extremely rare. With the introduction of celluloid in the 1920s, more and brighter colors became possible. As for metal overlays, they were usually in the Art Nouveau style from the 1890s through the ’teens. Overlay work done by the Heath company for Waterman is particularly prized, and while they made them for other pen brands, the Waterman commands three times the price of the closest competition. Around 1910 pens started to get fancier, and, despite the general rule about contemporary versus vintage, the two most expensive, legendarily rare collectible examples are from this era—the Dunhill Namiki maki-e pen (decorated with a special Japanese lacquer) and the Parker “Aztec” pen (actually called the Awanyu model). Either of these could go for $100,000 if one happened to appear on the market in good condition. Maki-e pens were sort of a fad in among collectors in London a few years ago, according to Briggs, so most were snapped up and went off the market, at least for now. The concept for the Aztec was born when George S. Parker, the company’s owner, was traveling in New Mexico and was shown a three-legged Native American motif he called the “Emblem of Mystic Power.” Made between 1911 and 1916 in gold or silver with the emblem and Indian-chief faces sculpted in high relief, only four to six examples are thought to exist. It’s truly a holy grail of pen collecting. Another famous Parker is the “Pregnant Parker” of 1909, so called because of the gentle swell of the mother-of-pearl-embellished barrel. Briggs says, “It’s considered the most beautiful pen ever made.” In 2011 Bonhams sold one for $7,200. 2013 © Art & Antiques Worldwide Media, LLC. All Rights Reserved.